Chag Pesach sameach to all celebrating the Passover Feast, in commemoration of the liberation of the Jews from slavery in Ancient Egypt, and their enduring covenant with G-d.
One of our favorite Passover traditions is the invitation to the the Prophet Elijah to pull up a chair, in a manner of speaking. This is when a glass of wine is poured after the Seder Graces (the "fifth cup"), the door to the room is opened (or a window to the outside), and the Prophet is welcomed in. Children watch closely to see if the wine has gone down in the glass, meaning Elijah has, in fact, graced the Seder with his presence. They get so excited when it appears that the liquid has gone down a bit, as if someone has taken a sip! Something does seem to happen. 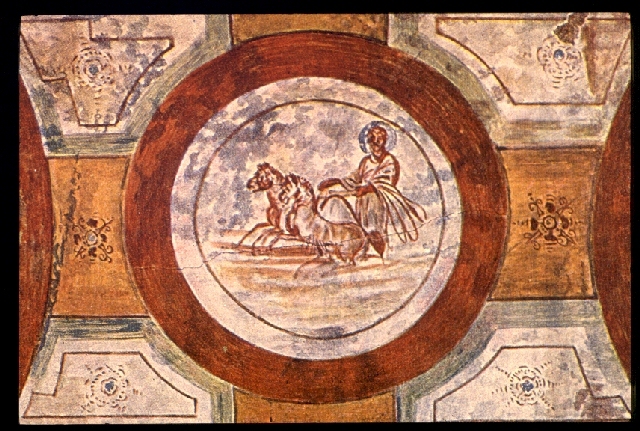 Also in the caption for this image is the identification "Elijah taken up in a chariot of fire," although initially we went with "big shot chariot driver waving the mappa (actually held by a racing official)." 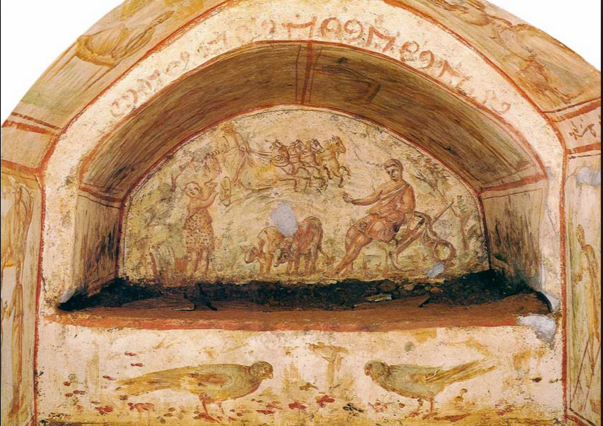 As the chamber name "Orpheus" indicates, the site of the fourth century CE is decorated with a mixed bag of motifs, Biblical-themed and otherwise. The Elijah scene is on the chamber's right side, in the back lunette of an curved niche tomb (arcosolium), framed in the inner archway by a repetitive lattice-like motif. 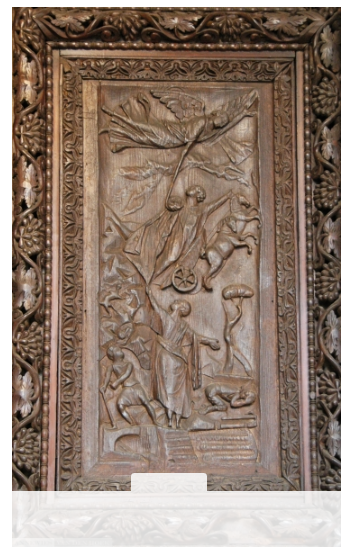 The photograph in the Pontifical Commission for Sacred Archaeology archives reveals that images on the walls around the niche include a praying figure (orans) at left, Noah in the ark directly above the niche opening, and the resurrection of Lazarus (?) at right. 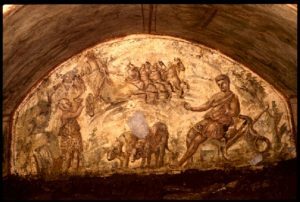 Does the lunette scene really depict 2 Kings? Elijah and faithful sidekick Elisha, who receives his mentor's cloak as it is dropped from the whirl wind or chariot of fire? Is the other guy at right a stand-in for the "fifty prophets" who would acclaim Elisha as Elijah's successor? It's hard to tell - loculi were cut into the wall at the bottom and top of the scene, eliminating Elijah's head as well as the backdrop (if any) between the figures at the sides, and the PCAS photograph in black and white (from a Wilpert image) does not provide higher resolution of the details. (Screenshot of the Ascension of Elijah - Santa Sabina, copyrighted to Annewies van den Hoek). Here the figure at right emerges as a shepherd, tending to some oblivious sheep. Four horses are galloping over the top of their heads, and Elisha, as an old man, dressed in spotted animal skins, extends both hands upward to receive the cloak being thrown to him by Elijah, already on his way. Consistent with the overall quality of the Dino Compagni painting program, the figures are detailed and multi-dimensioned, only the shepherd is rendered a bit larger and more confidently than the other two, even though he and his sheep have little relevance to the Biblical narration. What he shares in common with the Hebrew prophets is his presence in the wilderness outside of civilization. The backdrop for all is a rocky outcropping pierced by a scattering of trees and scrubs. The shepherd, lounging on a rock, stocked with tools and provisions, and seemingly not at all surprised by unfolding events, is the one most at home in the site. A stand-in for a divine helper, like the angel giving Elijah a hand with the ascent in the Santa Sabina doors? Or referring in some mystical capacity to the connection of nature to the divine? Or just stock imagery that fills the space? (some scholars do not even mention him). We halt on the threshold of more speculative discussion, because part of the fun is awaiting the revelation. May Elijah soon be among us! And, in this Passover/Easter season, may peace and love be warmly received at all our tables.